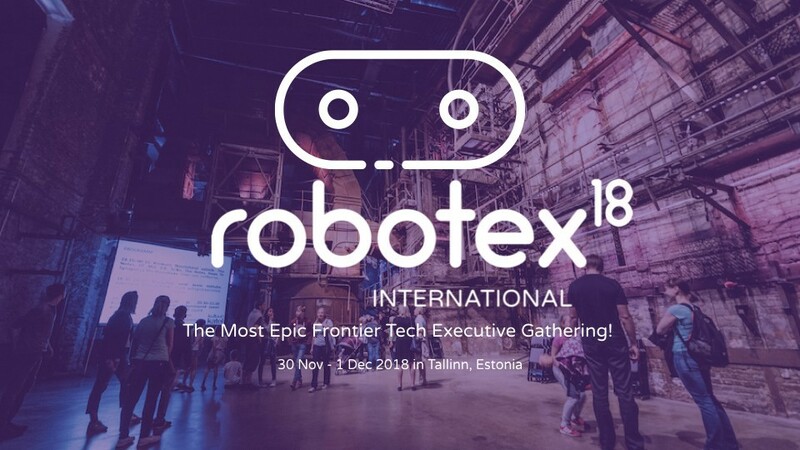 From November 30 to December 2, Tallinn will be home to Robotex International 2018, on of RobotUnion’s community partners and one of the biggest robotics festival, gathering more than 30 000 attendees from all around the world. The Robotex International Conference is one of the must-attend events in the program for everyone who wants to stay up to date with the latest tech trends. The conference will bring together 50+ top executives and influential players of frontier tech and is going to focus on how the future technologies will transform our businesses and everyday lives. These world-renowned thought leaders will tackle topics that are intriguing and relevant to the rapid changes and dramatic developments on the tech scene. So make sure to join the conversation! The event will bring into the spotlight themes such as AI, machine learning, data science, robots, cybersecurity, Industry 4.0, logistics, space technologies, STEAM education, and many more. Various panel discussions and workshops on robotics, technology and entrepreneurship have also been planned, so there will be plenty of activities for everybody. Cassie Kozyrkov (USA), Chief Decision Scientist at Google Cloud who works to democratize statistical thinking and machine learning. Cassie will deliver the opening keynote “Why Do Businesses Fail At Machine Learning?” and run a workshop “Executive Briefing: Most Data-Driven Cultures… Aren’t” on building data-driven cultures in global organizations. David Delgado (USA), Visual Strategist with The Studio at NASA’s Jet Propulsion Lab and one of the creators of the Museum of Awe, a project that blends art, science, theatre, food, and surprise mixing the visual with the informative. David will be giving a speech on “Imagination, Desire and the Call of the Future”. Peter Vesterbacka (Finland), the Co-Founder and Brand Breaker of Lightneer, a game studio that strives to achieve positive social impact through fun and innovative mobile games. Peter was also the Mighty Eagle at Angry Birds for many years and was named one of the 100 most influential people on the planet by Time Magazine in 2011. The list of speakers and topics is growing by the day, so make sure to keep an eye out for the agenda in Twitter and Facebook.